Universidade de Évora promove curso durante o verão onde a prática é o principal elemento da formação dos 24 alunos envolvidos. Today's top-end combines are at the limits in terms of width and height, but not length - an area that Massey Ferguson is clearly looking to exploit. 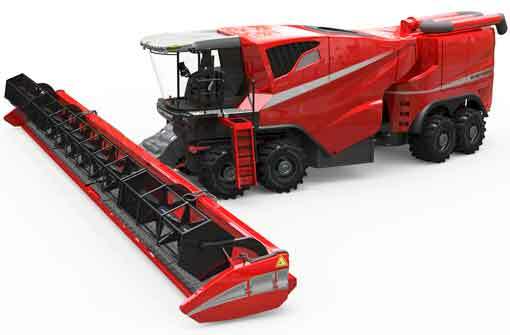 Providing a glimpse of what big combines could look like in 2030, this futuristic design comes from Coventry University student Henry George Parnell. Supporting a massive 60ft (18.29m) header and offering a whopping 11.4sq m of threshing area, it has a target weight of 22t. Power comes from a 700hp engine and all eight wheels also have their own 65hp electric motors. The 18,000-litre grain tank is located behind the articulation point. Hydraulic rams will allow operators looking for even more capacity to push out the sides by a metre. The tank then holds 24,000 litres. Four axles help to spread the load and even though it is 12m long, the combine can still be legally driven on the road.